Lois Maxine Dobbin was born April 14, 1917 on a farm East of Viola, Kansas to Thomas M and Alma R. Dobbin. She grew up in Wichita, Kansas. Lois graduated from East High in Wichita, Kansas and later attended Wichita State University, where she was President of the Delta-Omega Sorority in her senior year. In 1941, while still enrolled in college, she had the opportunity to take the CPT (Civilian Pilot Training) program. After earning her Bachelor's Degree and her civilian private pilot's license, she went to work at Boeing’s Stearman Plant in Wichita. It was there she heard about the WASP program to train women pilots to fly military aircraft. Lois applied and was accepted for military flight training in class 43-8. In 1943, she paid her way to Avenger Field, Sweetwater, Texas, to enter the Army Air Force training program for women pilots. Of the 95 women pilots who entered class 43-8, Lois was one of only 48 who successfully completed the six months of training and graduated. 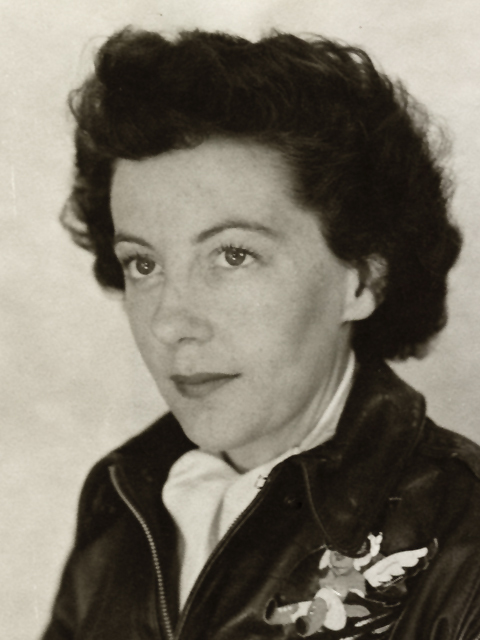 After earning her silver WASP wings, Lois received her official AAF orders, sending her to Williams Field, Arizona for duty as an AT-6 engineering test pilot. During her career as a WASP, Lois flew the PT-17, PT-19, BT-13, AT-6, UC-78, AT-9 AND AT-11. Her dedication and service, together with that of the other Women Airforce Service Pilots, released hundreds of the Army Air Forces desperately needed male military pilots for combat duty. After the WASP were deactivated, Lois built a career around aviation-related jobs: working at flight schools; writing pilot flight manuals at North American (AJ-1 and XA25-1); working as a secretary for an aircraft parts service company in Wichita; and eventually working for over thirty years as a technical editor and proposal coordinator for Raytheon in Massachusetts. In 1981, Lois became a charter member of the Women Military Aviators (WMA), an organization that included both WASP and other women military pilots. She helped write the original by-laws and continued networking with members from various flying branches of the military for many years. Lois enjoyed flying her own Cherokee 180 for over twenty years. She was very active in the Ninety Nines (international civilian women pilots) organization, and helped manage the All-Women New England Air Race for several years. She flew co-pilot in the 1961 Powder Puff Derby from Calgary, Canada to Baton Rouge, Louisiana, and In 1972, Lois entered and won the All-Women New England Air Race. Lois met her husband, Charles Auchterlone in college. Later, they married and made their home in Acton, Massachusetts until Charles retired. In 1987 the couple moved to Anacortes, Washington. They were married for 32 years. After she lost her husband, Lois spent her time fostering cats needing new homes, as well as serving as the volunteer treasurer at the church thrift shop and treasurer for a church women's group. She remained active in the local community club as well as playing a few rounds of golf. However, she referred to attending the WASP and WMA reunions as "The highlight of my year." In 2010, Lois, together with her sister WASP, was awarded the Congressional Gold Medal for her service as a pilot during World War II. Lois passed away peacefully on March 24, 2013 following a fall at her home in Snohomish Washington. She is preceded in death by her parents, her husband, and her brother. She is survived by brother-in-law, Kenneth Auchterlonie and numerous nieces and nephews. A Memorial Service will be held at 2:00 pm, April 20, 2013 at Evergreen Funeral Home, 4504 Broadway in Everett. In lieu of flowers, the family asks that donations be made to the Animal Shelter of your choice. from Betty Turner's "Out of the Blue and Into History" p. 267 and Byrd Granger's "On Final Approach." Photo from the Wings Across America digital archive.